Aten - Creator God and Aspect of Ra. - Egyptian God. Aten Aton is a creator God all of creation is said to emanate and exist with the God. Home ¦ Divinity of the Day ¦ Egyptian Gods and Goddesses ¦ Aten - Creator God and Aspect of Ra. Aten - Creator God and Aspect of Ra. Aten (Aton) is a creator God, all of creation is said to emanate and exist with the God. He was originally an aspect of Ra, the Sun God, but rose to prominence under the pharaoh Akhenaten (Amenhotep IV). 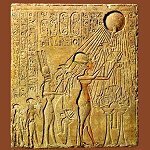 The Aten is a depicted as rays of light extending from the sun's disk.